"Destiny (DC Comics)" redirects here. For other DC topics, see Destiny (disambiguation). The Endless (Destiny, Death, Dream, Destruction, Desire, Despair, and Delirium) are a group of fictional beings appearing in American comic books published by DC Comics imprint Vertigo. 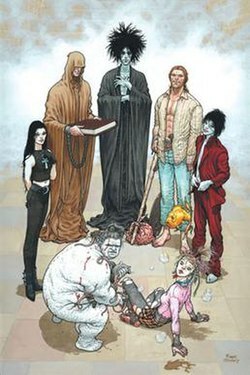 The characters embody powerful forces or aspects of the universe in the comic book series The Sandman, by Neil Gaiman. They have existed since the dawn of time and are thought to be among the most powerful beings in the existence. They are distinct from and more powerful than most gods. Dream is the protagonist of The Sandman series, but all of the Endless play major roles. The Sandman (vol. 2) #1 (January 1989). The Endless are a somewhat dysfunctional family of seven siblings. They may appear in different forms, but usually have light skin and black hair, with the exception of redheads Destruction and Delirium. Their appearance can change to fit the expectations of others. When asked by Marco Polo if he is always so pale, Dream replies, "That depends on who's watching." Some of the Endless are more dedicated to their tasks than others. The younger Endless, especially Desire, are known to play games with mortal lives. Destruction, often called "The Prodigal", abandoned his duties altogether. If one of the Endless is destroyed, then he or she will be replaced by another aspect of their role, but this does not occur if they are simply absent or inactive. In such cases, the aspect of existence supervised by that member of the Endless becomes more random and chaotic. During this time the Universe may attempt to replace that member by putting some of their essence within a mortal, as it did with Wesley Dodds, who received a fraction of Dream's soul while Dream was imprisoned. Each of the Endless has a realm in which they are absolutely sovereign. Within their realm, each member of the Endless has a gallery containing symbols, or sigils, of the other Endless. The Endless may contact each other by holding the appropriate sigil and calling for that member of the Endless. Destiny is also able to summon his siblings by using his gallery of portraits, whether they want it or not (as seen in The Sandman : Overture). In addition to overseeing their own sphere of influence, the Endless also help to define their own opposites. This dualistic aspect of the Endless has been confirmed in the case of Death, who is present at the beginning as well as the end of every life. Destruction has an interest in creative pastimes, including art, poetry and cooking. Dream seems to have some power to shape reality, as seen in The Sandman (vol. 2) #18, A Dream of a Thousand Cats, in which a large number of entities, dreaming of an alternate reality, create said reality. Also, Delirium has some kind of strange logic that only makes sense to her, but that allows her to understand things that others do not. In the Sandman Overture, it was revealed that under some conditions, some Endless can fool other Endless by trickery and use some of their powers (either directly or due to some specific kind of logic). Indeed, Dream was capable of saving the dead Prez from Boss Smiley, while Death could not do it herself (this is because Dream is also The Prince of Stories – which allows him some control over the afterlife). Desire was capable of posing as an aspect of Dream (The Dream of Cats) and create a dream Vessel that was supposedly created by Dream. It was convincing enough to fool both Destiny and Dream (but not Delirium). The exact limits of the powers the Endless may/must use are subject to debate - but are set by rules (such as Dream being forbidden to kill dreamers, unless they become a vortex - in which case, killing becomes an obligation). It is unknown if the Endless are allowed/capable/supposed to use their powers on those more powerful or more ancient than them; when at one point Dream heads into Hell in an effort to rescue a former lover of his, he admits that his power will allow him entrance, but that he does not know if he would be able to defeat Lucifer, who is a former archangel created by The Presence (the DC comics analogue of God). The origin and exact nature of the Endless is unknown. Few hints are ever given in the series as to exactly why the Endless exist. They seem to be natural forces. They have at times been described as "a creation of the consciousness of living beings". The Endless are as old as the concepts that they represent. The Endless are said to be older than the fairyfolk, gods, and other supernatural beings. Their exact ages in years are unknown, but they are known to have existed long before life on Earth; in Brief Lives, Destruction says that he has performed his duties—not counting the previous three centuries—for 10 billion years. In The Sandman (vol. 2) #5, "Passengers", Dream is recognized by the Martian Manhunter as the dream god on ancient Mars, as well as in the Endless Nights chapter "Dream: The Heart of the Star", which takes place before our Sun's planets have "awakened" with life. Dream states in The Sandman (vol. 2) #16 that once another world was lost to a vortex. Death has claimed that she was there when the first living thing stirred, and Destiny has said that Dream gave the Earth itself the fond dream of being able to support life. Dream, according to Abel, was created shortly after Death, as living things are born before they can dream. One of the few references to any sort of parentage for the Endless is in The Sandman (vol. 2) #70, where some sentience in the Necropolis Litharge that guards the symbols of each of the Endless wails "like a mother sorrowing for her departed child." In The Sandman: Overture #5, it is revealed that the father of the Endless is Time, their mother is Night. Night is accompanied by Dusk, who was described by illustrator J. H. Williams III as a "distant sister" to Dream. The Endless are not known to have proper names, although Dream has a habit of collecting different names for himself. They are each known by their respective function. Destiny: The oldest of the Endless, Destiny appears as a blind man dressed in grey or brown robes (purple in earlier comics), carrying a large book, the Cosmic Log. The book is chained to him, or he is chained to the book, and within the book is written the entire sum of existence, past, present and future. Destiny seems the most possessed by his function and responsibilities of any of the Endless. He rarely demonstrates much personality. His sigil is his book. His speech appears as a regular word balloon with letters in italics. In his garden are paths souls walk along as they fulfill their lives. Destiny is the only sibling who did not originate in The Sandman; he was created by Marv Wolfman and Bernie Wrightson for Weird Mystery Tales in 1972. Death: Death appears as a level-headed young Goth woman. She wears a silver ankh (representing the afterlife), which serves as her sigil. She has a marking similar to an Eye of Horus around her right eye. She prefers to dress and act casually, and is on better terms with Dream than any of the other Endless. Her speech is presented in regular letters in a regular balloon. She spends one day out of every century as a mortal, living and dying on Earth. Dream (Morpheus): Portrayed as both lord and personification of all dreams and fictional stories. His face and physique is based on the amalgamation of Neil Gaiman in his twenties, The Cure's frontman Robert Smith, ballet dancer Farukh Ruzimatov and Bauhaus frontman Peter Murphy. Journalists have listed Dream among the best comic book characters. Dream's usual appearance is as a tall, pale man with wild dark blue-black hair. He dresses in a shapeless cloak of "night" with "flames dancing in its folds". His eyes are pools of shadows with glimmers of light within. He is known by many names, most commonly "Morpheus". He has a long history of insensitivity towards others, and throughout The Sandman, he must come to deal with his past cruelties. He is very concerned with fulfilling his responsibilities. His sigil is his dream-helm, made from the spine and skull of a long-dead god. His word balloons have wavy edges and a black background outlined in white, with white lettering. Dream (Daniel): Morpheus' successor appears as a tall, pale young man with white hair and a white costume. Like Morpheus, his eyes are formed by shadows with a glimmer of light in their center. Before becoming the new Dream at the end of The Sandman, he was a young boy named Daniel, which he later retains as a name. Daniel was gestated in dreams for two years, the child of Lyta Trevor-Hall and the ghost of Hector Hall. He is generally softer in his approach than Morpheus. Daniel carries an emerald eagle stone, although his sigil remains the same (that of the dream-helm). His word balloons are similar to Morpheus', only with a white background and black lettering. Destruction: A very large, robust man with red hair, who sometimes appears bearded and sometimes shaven. Destruction abandoned his responsibilities as one of the Endless three hundred years ago, causing much conflict between him and his siblings. Since abandoning his realm, the other Endless usually refer to him as "the Prodigal" or "Brother" rather than "Destruction". He has a passion for creative and constructive endeavors, but little talent. His sigil is a sword. His text is normal, but is in a balloon with a bold outline. Desire: Desire is androgynous, capable of appearing as a man, a woman, neither, or possibly both. Desire has a cruel streak and a long-standing rivalry with Dream. Their sigil is a silver-tinted glass heart shape. Although Desire is Despair's twin, in a sense they're older than Despair. The current incarnation of Desire is the original one, while Despair is currently in her second incarnation. Desire's text is defined by a specific letter style in a normal balloon. The First Despair: In her first form, Despair had many of the same physical qualities as her later form, but taller and tattooed with intricate red lines. She was also much more talkative and self-assured than her later incarnation. She is occasionally mentioned in passing, and is later depicted in The Sandman: Endless Nights. It is hinted that she may have been responsible for the destruction of the planet Krypton as a means to create the ultimate despair. It has been suggested that she was actually murdered, and that the one responsible will suffer until the end of existence. The Second Despair: A short, obese woman with greyish skin and irregularly-shaped teeth. She is always naked. Despair has a cold, quietly intelligent manner. She has a habit of carving her flesh with a hooked ring that she wears, which is also her sigil. The second aspect is the one that appears throughout the main storyline. Despair's text is normal in a balloon with ragged-waved edges. She often associates with Desire, but unlike Desire she was fond of Destruction. Delirium: The youngest of the Endless, Delirium appears as a young girl whose form changes the most frequently of any of the Endless, based on the random fluctuations of her temperament. She has wild multicolored hair and eccentric, mismatched clothes. Her only permanent physical characteristic is that one of her eyes is emerald green (usually the right side) and the other pale blue with silver flecks (usually the left side), but even those sometimes switch between left and right. Her sigil is an abstract, shapeless blob of colors. Her speech is portrayed in standard graphic novel block-caps, characterized by wavy, unpredictable orientation and a multi-colored gradient background. She was once known as Delight, but some traumatic event (of which even Destiny does not know the particulars) caused her to change into her current role. Her sigil as Delight was a flower. Several entities have falsely claimed to be members of the Endless. "Dread of the Endless" attempted to conquer the Dreaming in the comic of the same name. She presented herself as Dream's sister. In a Lucifer storyline, Titans Gyges and Garamas identified themselves as Duplicity and Deceit in an attempt to gain control of the Heart of the Dreaming, with Lucien dryly noting that the two concepts are identical. ^ "The Sandman Connection: How Vertigo's Flagship Title Crossed Over With the DCU". ComicsAlliance. Retrieved 1 April 2018. ^ Jonathan Curiel (April 18, 2014). ""The Sandman" Speaks: Neil Gaiman and Mike Dringenberg on the Glories of Their Graphic Novel". SF Weekly. Retrieved 26 April 2014. Mike Dringenberg: "The Sandman himself is even more of a composite. Certain well-known people influenced the design -- his mop of hair came from Robert Smith and ballet dancer Farukh Ruzimatov was always in my mind for his dramatic physique,..."
^ Dave McKean; Neil Gaiman (1997). The collected Sandman covers, 1989-1997. Watson-Guptill. p. 1. ISBN 9780823046324. The Sandman image was inspired by Peter Murphy, the ex-Bauhaus singer and Maxell tape model, because when artist Mike Dringenberg saw the original sketches for the character he said "He looks like Peter Murphy from Bauhaus." ^ Neil Gaiman (February 16, 2013). "The official Neil Gaiman Tumblr". Tumblr. Retrieved 10 July 2013. The original idea-model for Morpheus was Peter Murphy from Bauhaus. ^ Neil Gaiman. "Neil Gaiman - FAQ - Comics". Retrieved 22 September 2012. If I remember correctly Dave based the face on the cover of Sandman #1 on an image of Peter Murphy. ^ Gavin Baddeley; Paul A. Woods (2006). Paul A. Woods (ed.). Goth chic: a connoisseur's guide to dark culture (2nd ed.). Plexus. p. 1941. ISBN 9780859653824. Sandman inker Mike Dringenberg observed, '"Hey, [he] looks like Peter Murphy from Bauhaus'". Cover artist Dave McKean and Gaiman 'got some Bauhaus videos and immediately saw that Mike was right; and Dave ended up making the central image on the cover of Sandman [number one] a Peter Murphy-like face. ^ "The 50 Greatest Comic Book Characters". Empire Online. ^ "Dream of the Endless - #15 Top Comic Book Heroes". IGN.